My first encounter with brilliant musician, the flautist Jane Rutter was via her awesome eclectic chamber group Posh when she toured extensively for Musica Viva back in the early 80’s in the Australia. I also remember a stunning performance with Richard Tognetti and the Australian Chamber Orchestra, one of many with renowned national and international orchestras and ensembles. Since then she has represented the beauty of sound in every way physically, seductively, technically, intellectually, intelligently, philosophically and practically. The way she has carried herself, her deportment when playing, the passion and meaning behind the sounds she produces, and the sheer skill attached to the sounds that she has brought forth from that single elegant silver pipe over the past 30+ years, have been nothing short of awesome in every way. It would be fair to say that during those early days, when combining seduction with sensational sound she would have ruffled more than a few feathers. What she was about however was important, she was busy bringing an instrument best known for its classical repertoire into contemporary culture and, in a big way. She achieved this with great style and panache, which in itself is worthy of thunderous applause. Jane Rutter, believes that ‘the flute is always first and foremost a voice, and that music is the secret language of the entire world’. She certainly represents seductive elegance and her style of music is, for me, best savoured in a space where the architecture is allowed to resonate gloriously with the beauty of the notes. Jane once won a ‘People’s Choice Award, no mean feat for a lady who seems effortlessly able to met morph from the brilliance of the flute’s classical repertoire, to the world of jazz and other popular music genres. Her actual playing continues to this day as a tour de force, one that often takes anyone, who has not encountered her, or the flute before completely by surprise. She makes this extraordinary instrument sing, speak and soar to such heights that is sometimes dizzying, although always dazzling and then, just as you believe you have reached that pinnacle of excellence and perfection leading to a paradise of pure sound, she eases you gently back down to the earth knowing that you have probably experienced your own personal state of Nirvana. 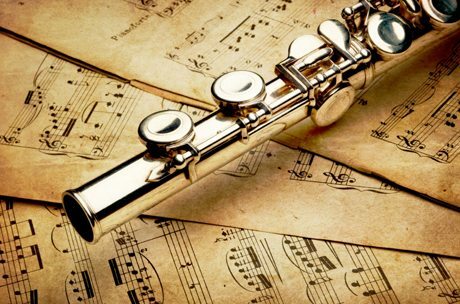 The flute is a completely magical instrument, one it always seems to me, was forged originally in heaven and then plucked from the morning sky to entice us into following its player. It requires great dexterity and skill to master it and to encompass the enormous breadth, depth and scope of its range. The God Apollo himself could not have revealed it’s intricacies better than Jane Rutter has; she is surely one of a few privileged muses who has, and helped to change the landscape of the art of music here in Australia forever. It has been very well done Jane and a flute of the very best French champagne would surely be the only way to celebrate. Jane Rutter describes herself first and foremost as a ‘Bel Canto’ flute player, a phrase penned by her mentors Jean-Pierre Rampal and Alain Marion, who were two of the flute’s great luminaries in recent history, and with whom she studied in that city of light Paris when she was 18 years of age. She attributes them with helping her to evolve what is now her own unique style. Since that first visit to Paris she has been passionate about telling the story of that great cities love affair with the human voice, most especially opera from the late nineteenth century during the Belle Epoque, the beautiful era. “It’s an elegant, passionate tradition that’s communicative, lyrical, and marvellously human: a narrative to the art of being expressive.” she has also been quoted as saying. Jane Rutter has become, during her career a centre for great flute playing, with her exquisite and innovative productions for which she, and they have achieved a big international reputation, lots of respect and everyone’s high regard. Her show An Australian in Paris is a virtuosic musical and poetic tour de force, which has evoked standing ovations for Jane in Paris and Australian cities and country towns on her latest tour. Tour dates are updated regularly on her website. In order to have a beautiful sound while singing beautiful melodies the breath support must be relaxed. One must never see the throat muscles working. It must come forth evenly. Bel Canto Flute playing requires complete mastery of tasteful phrasing. Its knowing about how to balance the sound of the pipe with say the dramatic meaning of a wonderfully written word. Crucial to the concept of beautiful singing is the idea that effortless delivery is a means to an end. That end is beautiful expression and Jane Rutter’s flute playing will surely go down in the history of Australian music as an effortless and expressive delivery of music, a mastery of appropriate musical style, and the natural beauty of a unique voice supplied via her silver flute well expressed in her rendition of My Heart Will Go On from Titanic. Jane Rutter is truly an inspiration for any young musician starting out, who would like to have a stellar career in the world of art and music. She has reached the highest pinnacle and for many, complete paradise in the beauty of sound.